Foundation work continued through the holidays and into the first days of 2016. The officers of the American Pyrotechnics Safety & Education Foundation wanted to provide a short update on current activities. Teacher and Student Guides produced by Widmeyer Communications have been finalized and will help ensure a greater understanding of, and adherence to, safety standards with regard to fireworks usage. The next step involves having the curriculum accepted on a state-by-state basis for use by educators, and the Foundation has retained Inez Tenenbaum, former Chair of the CPSC to spearhead this effort. In late January, Ms. Tenenbaum was joined by Foundation Vice President Kevin Gilfillan, Pyro Spectaculars, for a meeting with officials from the California Department of Education. The staff was supportive of the Celebrate Safely initiative and thought the five modules contained in the curriculum kits were a broad fit with the State's current health & education standards to prevent injuries & avoid potentially dangerous situations. The Department provided several suggestions for reaching out to school districts to distribute materials - including working with the state's science teachers through the California Science Teachers Association. A meeting with the Director of the Center for Education Safety (CES) in Missouri is scheduled for mid February. Foundation President Michael Ingram, Fireworks Over America and Advisory Board Member Justin Thomas, J&M Displays will join Ms. Tenenbaum for this meeting that will also include the Missouri State Fire Marshal. Initial contact with the CES has been positive and it is hoped that they will be both an advocate and resource for the Foundation. Once completed, the animated vignettes could be used together as a complete lesson narrative, or viewed individually. The short features will be designed to grasp the attention of students and enhance the classroom learning experience by bringing the curriculum to life. Additionally, they will be easily distributed through social media channels such has YouTube, Twitter and Facebook. Thanks to the efforts of Foundation Board Member Tad Trout, TNT Fireworks, we're pleased to report that the National Fire Safety Alliance of California recently made a very significant donation to further the Foundation's mission of creating fireworks safety education programs for youth. 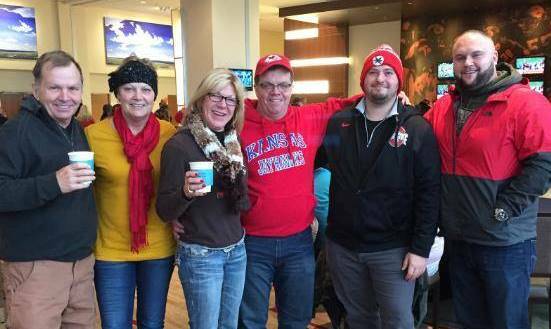 Foundation friends enjoyed a fun-filled day of football this past December at the Kansas City Chiefs vs. Cleveland Browns game. Thanks to Tami Bridgeman, Britton Gallagher for placing the winning auction bid and to Winco Fireworks for donating the package.